Xavier University is home to the Xavier Musketeers.The university is located in Cincinnati, Ohio. 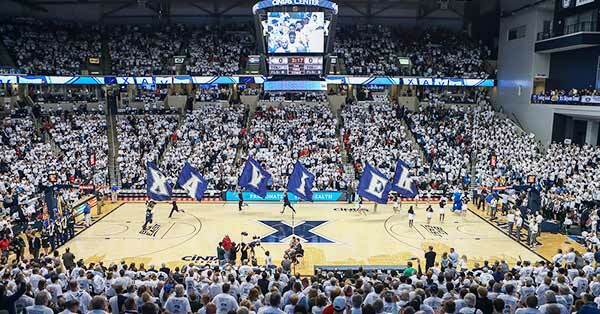 Get tickets to see the Xavier Musketeers in action with Ticket Galaxy! Xavier University is located in Cincinnati, OH. The Xavier Musketeers Men's Basketball team compete in the Big East Conference since 2013. Before the switch, they played in the Atlantic 10 Conference. The Xavier Musketeers Men's Basketball team is a dominant force in college basketball. They have appeared in the NCAA Tournament 27 times and won four Atlantic 10 Tournament Championships. Xavier is highly regarded as one of the top college basketball programs in the country. After making it to the Elite 8 in 2016-2017, Xavier became a steady prospect in the Top 25 in the 2017-2018 season. Visit the official Xavier Musketeers Men's Basketball page for more information. Purchase your Xavier Musketeers Men's Basketball tickets for their 2018 tour at Ticket Galaxy! Choose your event date and click "Find Tickets" to bring you to our array of seating options. Select your tickets on the maps page by clicking the price box. From there, TicketGalaxy.com will bring you to our checkout. Get your Xavier Musketeers Men's Basketball tickets quickly and easily today! Ticket Galaxy is the Official Partner of Xavier Athletics.